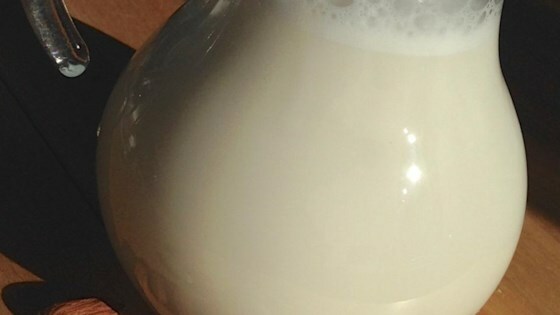 "Almond milk is a delicious and healthier alternative to soy and cow milk. It's easy to make and very delicious. The longer you soak the almonds, the creamier the milk turns out." Blend almonds and 3 cups water in a blender on low speed for 10 seconds. Turn blender off for 5 seconds. Blend almonds and water on high speed for 60 seconds. Pour mixture through cheesecloth or a nut bag into a bowl. Discard the pulp or save for another use. Clean the blender and return milk to blender; add agave nectar and salt. Blend milk until smooth. Any sweetener, such as honey or maple syrup, can be substituted for the agave nectar. The nutrition data for this recipe includes the full amount for the almonds. The actual amount of almonds consumed will vary.